My son loves Thomas the Tank Engine, so I knew I had to make a Thomas cake for his second birthday. The cake turned into a full train when we decided to share the party with his two cousins – ages 1 and 6. As always happens with my cakes, my initial thought was “How hard can it be?” Well, this one was a challenge. I had grand plans of carving and sculpting Thomas by hand – which I know I could have done!! – but time and logistics dictated a shortcut, so I used the Wilton Choo Choo cake pan. It worked *pretty* well, although if you were able to see the other side, you’d see that it’s only about 2/3 of a train. I opened the oven around 40 minutes into the 50-minute baking time to peek on it, and the cake had overflowed the pan, oozed off the cookie sheet and onto the oven element, and was on fire. My little son was right there, wide-eyed! He actually obeyed my yells of “HOT HOT HOT Go to your Daddy now!” and ran to safety. Fortunately he was not traumatized by his cake’s accident, although he did say “Hot” every time he saw the cake. Next time I will use cooking twine to tie the two halves of the pan together. Anyway. Once the cake was out, cooled and repaired, the decorating began. I used an online Thomas the Tank cake step by step guide to get hints to make the face – which really helped. I never would have thought of using balls in the cheeks to puff them out! I made the face 4 days in advance out of fondant and a cake pop stick and it worked out well. Thomas was just the single train cake, with a few patches here and there. The two cars were made from loaf pans, cut out and stacked, and carved just a bit. I formed the wheels out of Rice Krispie treats (best cake sculpting medium ever! ), and put it all on a large piece of foam core. 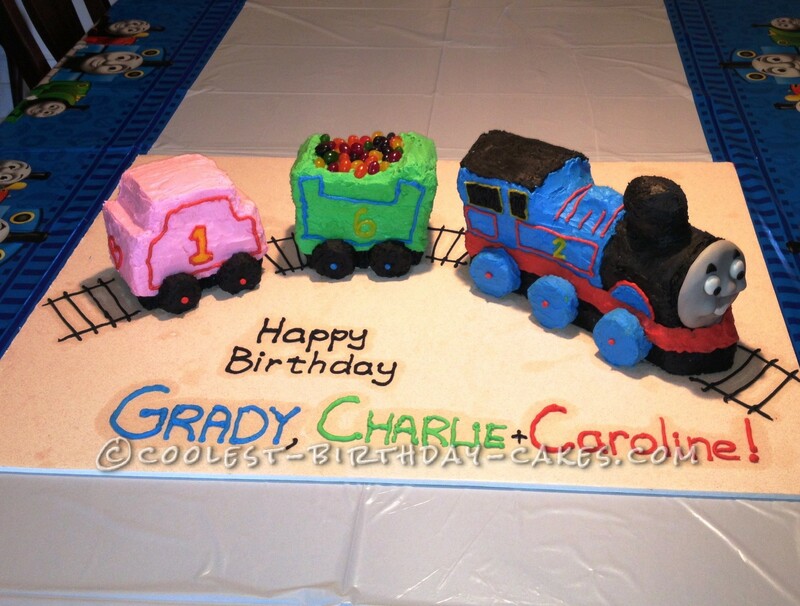 Everything else is frosting (I changed Thomas to #2 since my son was turning 2. This is probably the last birthday I can make a change like that!) Sculpturally it was not hard, but decorating it was tricky due to all the nooks and crannies. Frosting the wheels was a challenge too – if anyone has tips for frosting round wheels, let me know… To make the black frosting, I started with chocolate butter cream and colored it black. The cake was a durable 3D cake mix which works really well. I use it for all my sculpted cakes. The final challenge was transporting it in the car (it barely fit in the seat with me) and keeping it intact despite the various road challenges of potholes, aggressive drivers (ours included) and hand cramps. We made it to the party, the kids LOVED it, and my son was over the moon to have his very own (Hot) Thomas cake.